Pilates for a Healthy Back and to ease Sciatic Pain. I have been having sciatic pain in my right side for several months now. My chiropractor said it's because my pelvis is rotated. I don't want to continue to have this pain and keep going in to get adjusted. Can Pilates help my sciatic pain? 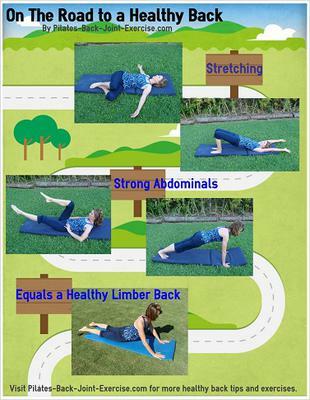 Pilates exercises can be very helpful to prevent sciatic pain. Pilates helps to realign muscles that are pulling the spine, pelvis, and sometimes shoulder girdle out of alignment. Pilates realigns the body by stretching the tight muscles on the one side and strengthening the weak or more flexible muscles on the other side of a joint. In effect, it helps to re-balance a joint bringing it back to neutral and allowing you to move with more efficiency and less pain. Because your pelvis is rotated, you first need to get the bones or the joint adjusted. Let your chiropractor do this if you are confident in him/her. Then, let most of the sciatic related pain and inflammation subside before you begin exercising the leg and hip joint or you will just keep inflaming it. I would recommend some specific exercises that will help to strengthen and stretch the muscles that are causing your pelvis to rotate. In particular, exercises that stabilize the pelvis and help to stretch and strengthen the muscles of the hips, gluteals, and the deeper piriformis muscle that can pinch the sciatic nerve. Leg circles (begin with the knee bent), bridging with a ball between your knees squeezing it gently as you roll up so you make sure each thigh is working equally, and doing prone leg stirs, and side kicks, in particular the clam shell exercise. All of these exercises can be found in my newly revised Pilates Ebook. Comments for Can Pilates Help Sciatic Pain? I have been doing Pilates for 2 years now and have not had any more sciatic pain. I think the most helpful exercises have been the Leg Circles and Side Kicks. These are in the Pilates Ebook and DVD. I have both.